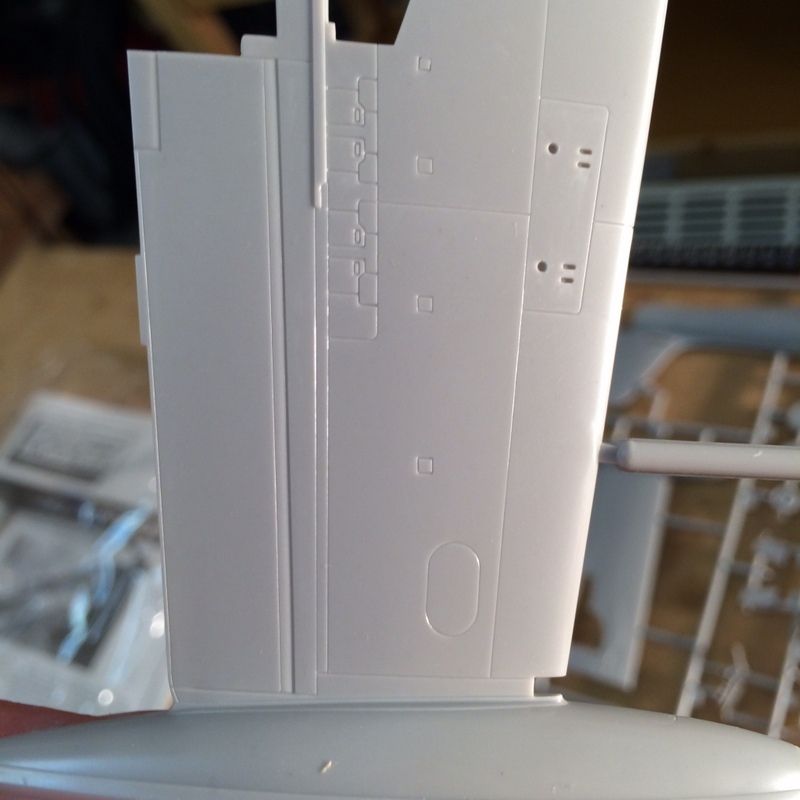 Continued tonight to work on the ProModeler F-84 cockpit. 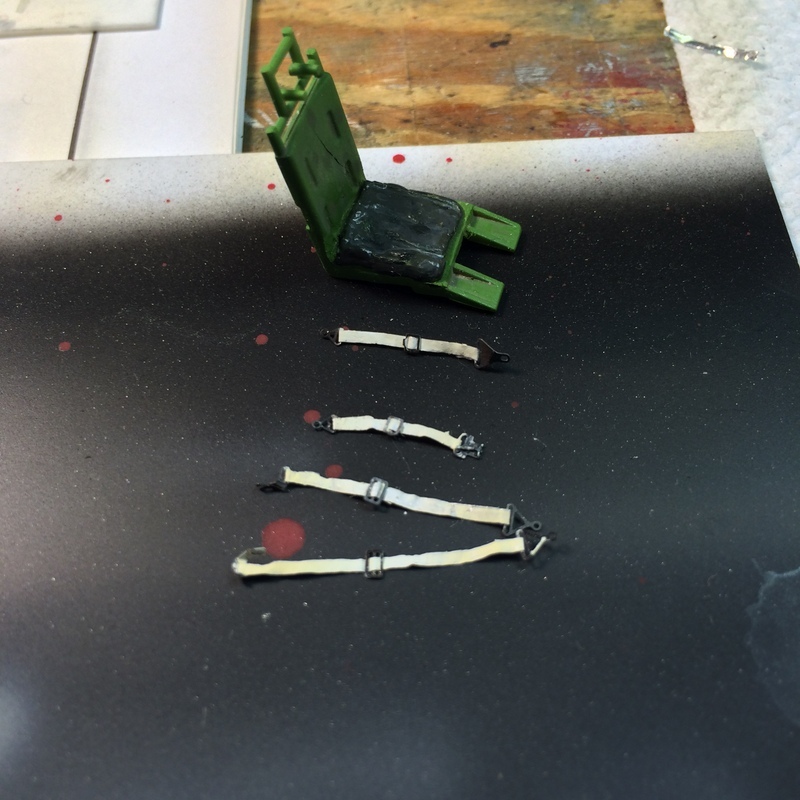 The kit comes with some nice photo etch for seat straps but gosh they are fiddly and these four straps have used up over one hour of modeling time. 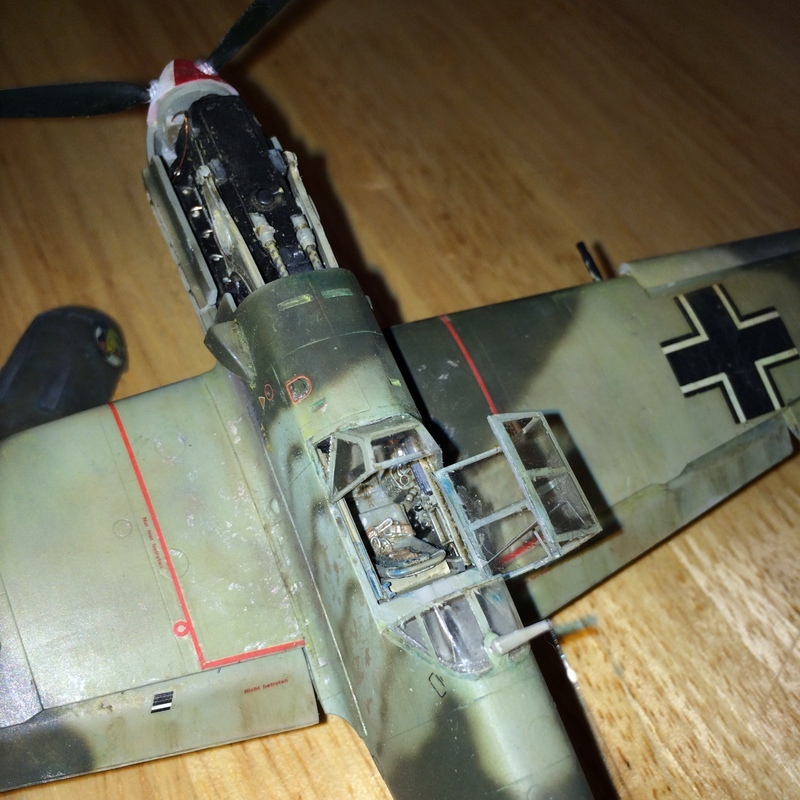 Completed the Bf-109 today with canopy photo etch and attach and the antenna. Looks pretty good! 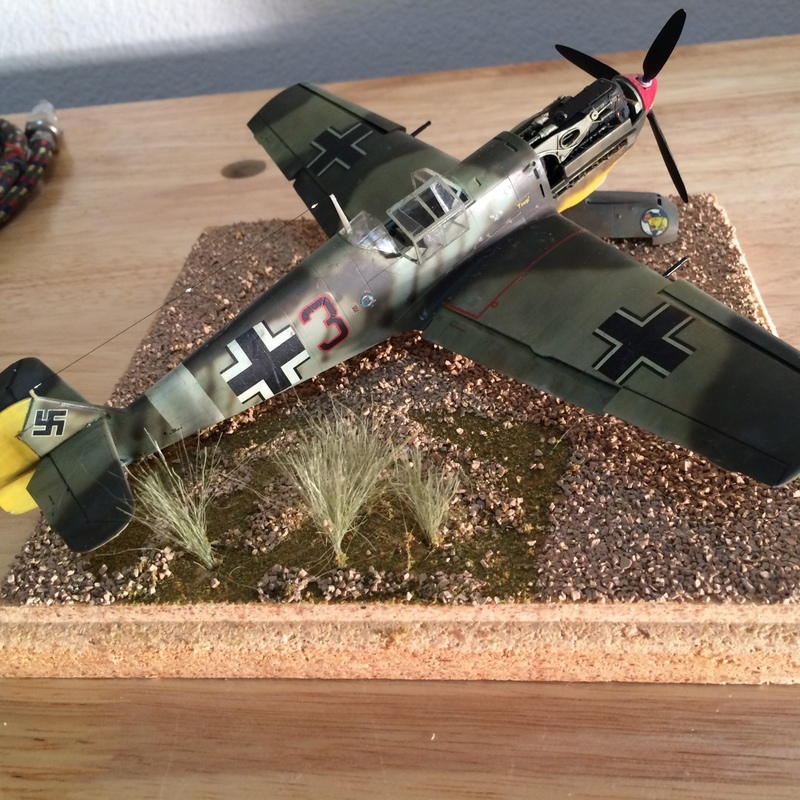 Over the weekend I think I’ll cobble up a display base for it. Desert sand shouldn’t be too hard, right? Last night I put on an oil filter wash. If you haven’t done this before it produces some very nice color variation on top of your camo. Start with a coat of future (done in previous posts). 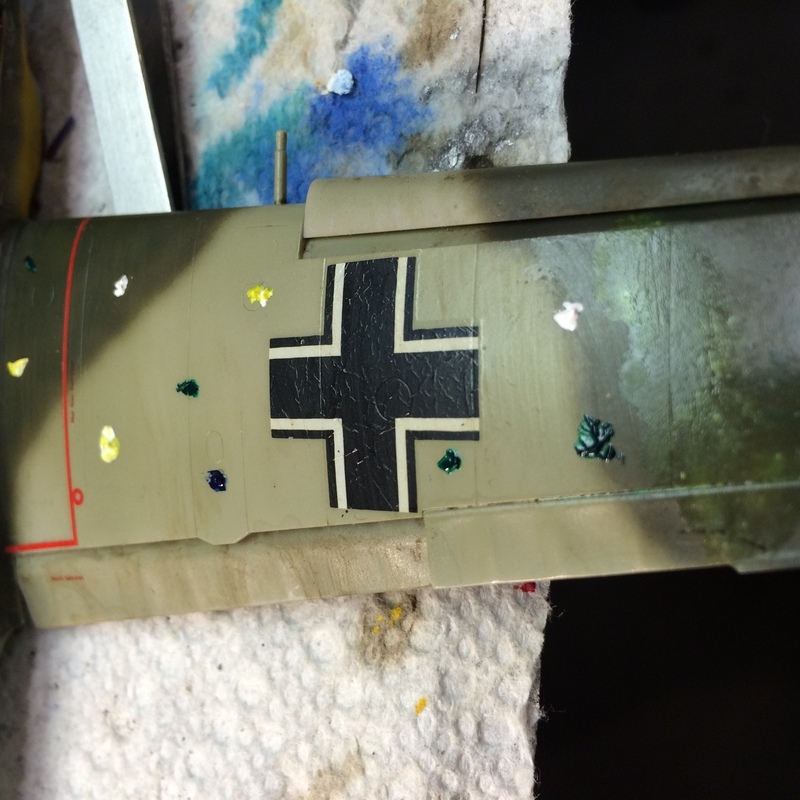 Then put small dots of oil paint color all over the model. I basically bought a small really cheap starter oil paint sets at a craft store and I have a life time supply of these colors. I keep experimenting with different colors; on this model I used blue, green, yellow, and white. 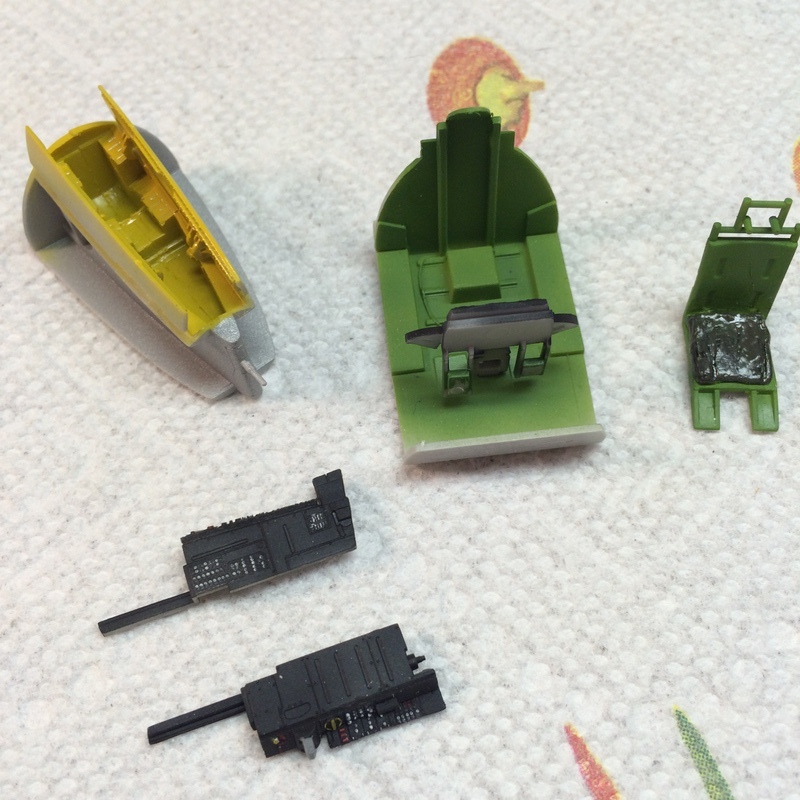 As you’ll see in the photos latter it gave the model a real green tint to parts of it. 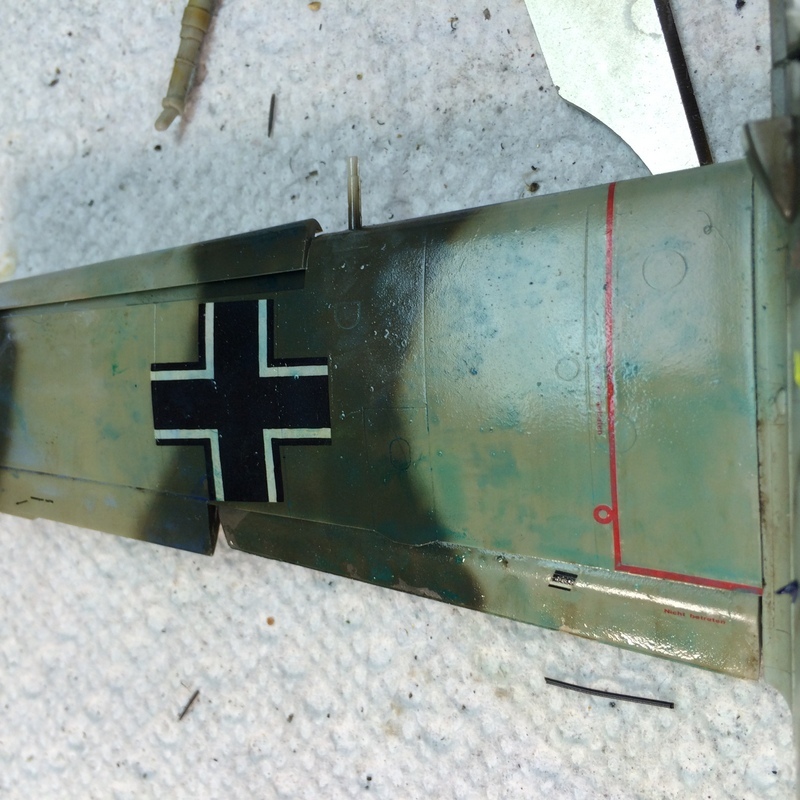 These colors work well on olive drab but I might try something a bit different next time I use Luftwaffe colors. 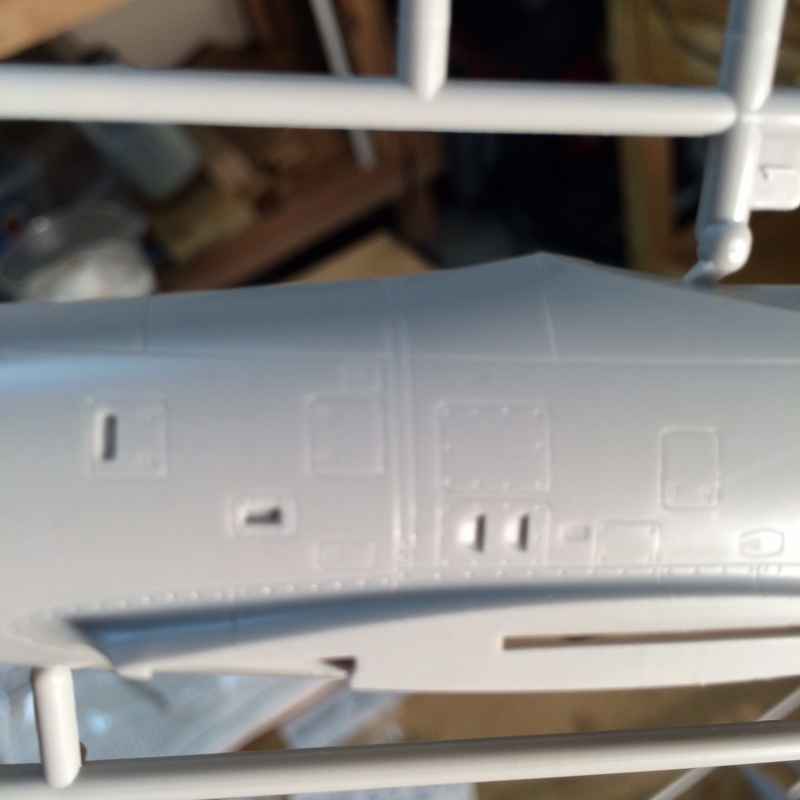 Once the dots are on, take a soft brush dipped in mineral spirits and spread the dots out in their area of the model. As you spread them out you will keep dipping your brush in the spirits and cleaning it off on a paper towel so that you are removing most of the paint. 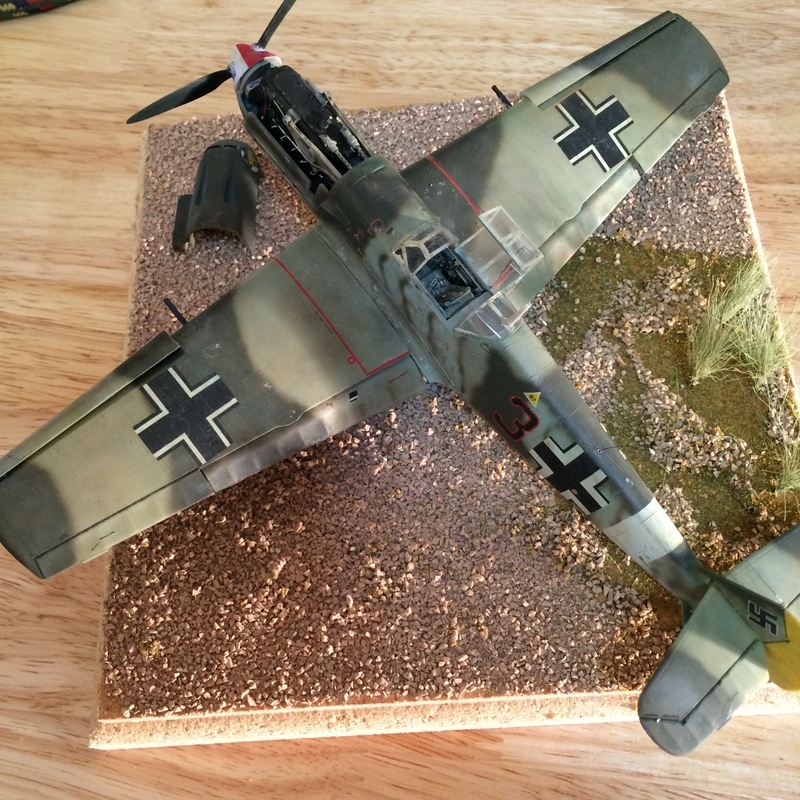 The idea here is to put a small thin coat of color on a small area of the camouflage and as you move around the model with different colors it will produce subtle color variation in your camo. I then take a paper towel dipped in spirits and wipe down most of the aircraft pulling up as much paint as I can and, by wiping in the direction of the airflow, giving the filter a sense of direction. 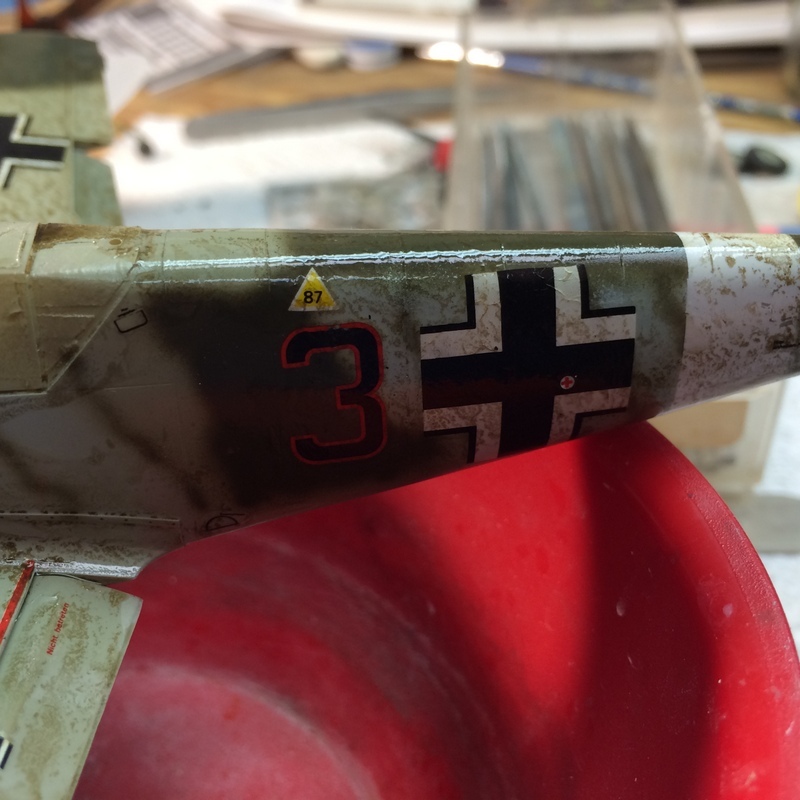 I have also included a side by side of the Hasegawa with an old Monogram 109 I messed around with a few years back. 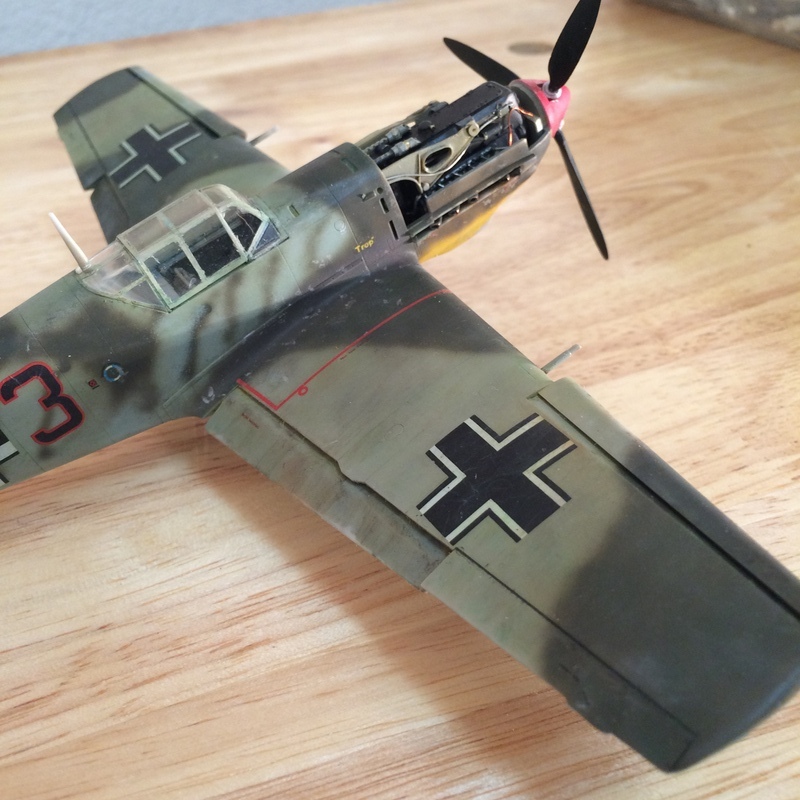 Years ago the Monogram 109 was the first model I ever put a camouflage on. 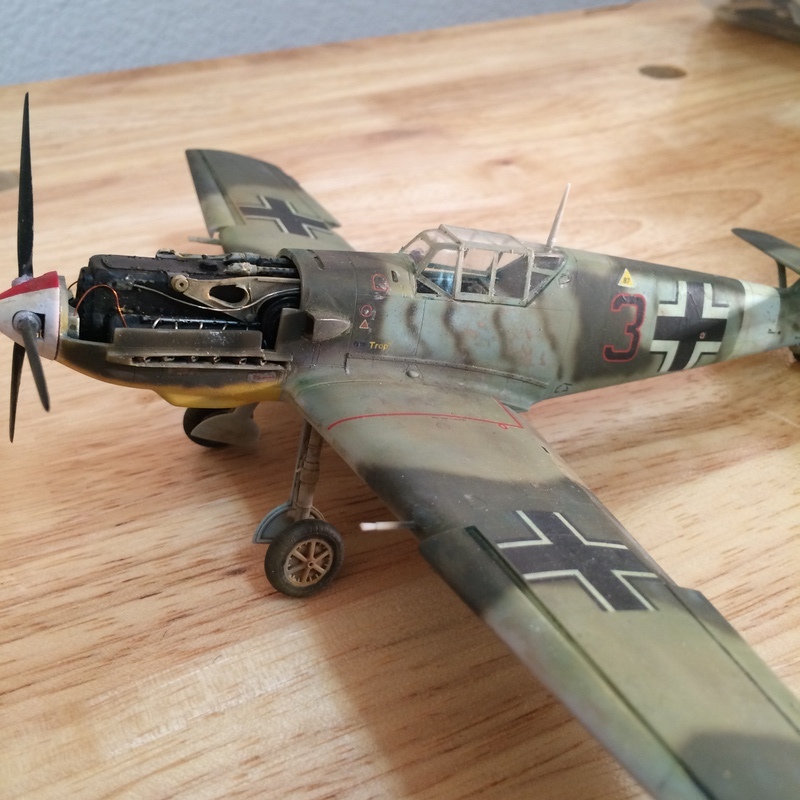 I was in 7th grad, bought it with lawn mowing money at a local Ben Franklin, and followed the directions called to paint the bottom of the model gray (green upper surface being the color of the plastic). I was hooked and still trying new things on plastic. 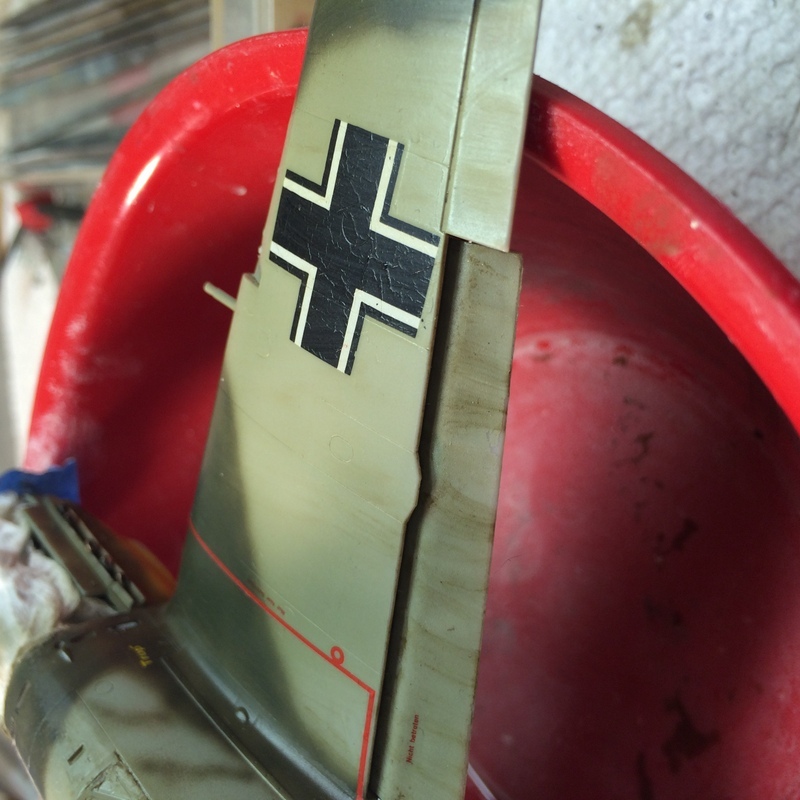 Time to start weathering the Bf-109. Not quite sure exactly what I’m going to do yet but as I always do, start with a sludge wash on burnt umber. 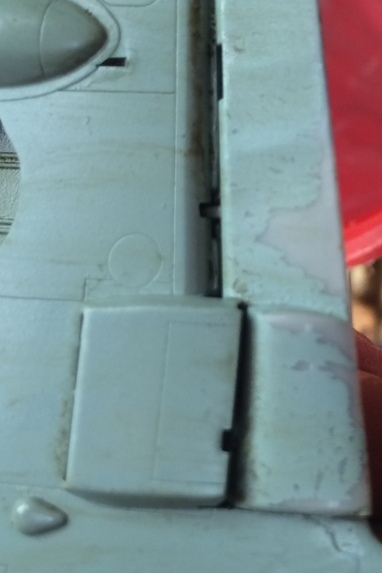 The two issues I had were the one part that never made it to future coating had the paint wiped away at the same time and I broke off one of the slats holding it by the wing. 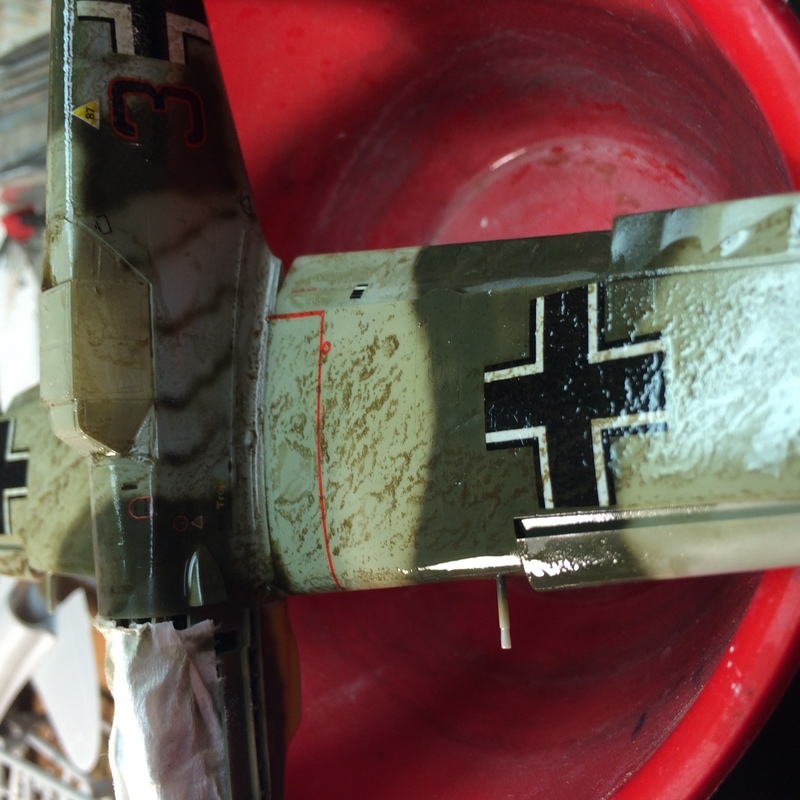 I think next up is going to be some oil dot weathering then I need to figure out a way to “bleach” the upper surfaces since the real thing was parked in the desert sun most of the time. 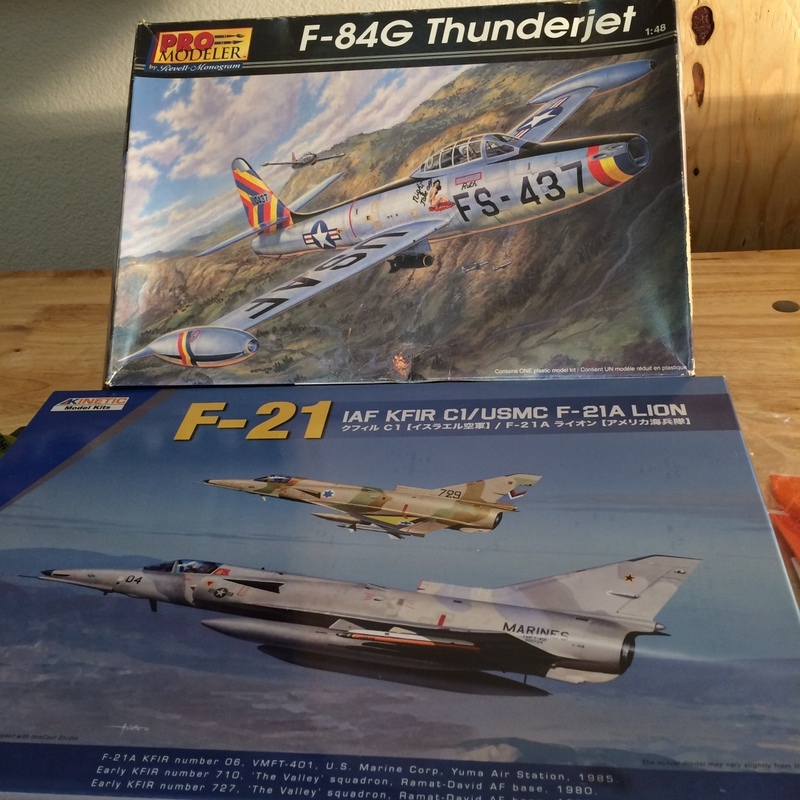 Next two on the list are the ProModeler F-84 and the Kinetic F-21. The F-84 because it is in on of the classes of models I want to build (50s jets) and has the same nose art theme (Night Take Off) as the P-61 I just completed. The F-21 Kfir was a great gift from the Lovely Bride for Christmas and I’ve had a thing for this type as the first kit I built 20 years ago as I came out of my modeling sabbatical was the Testors 1/72 F-21, which I still have on the shelf. 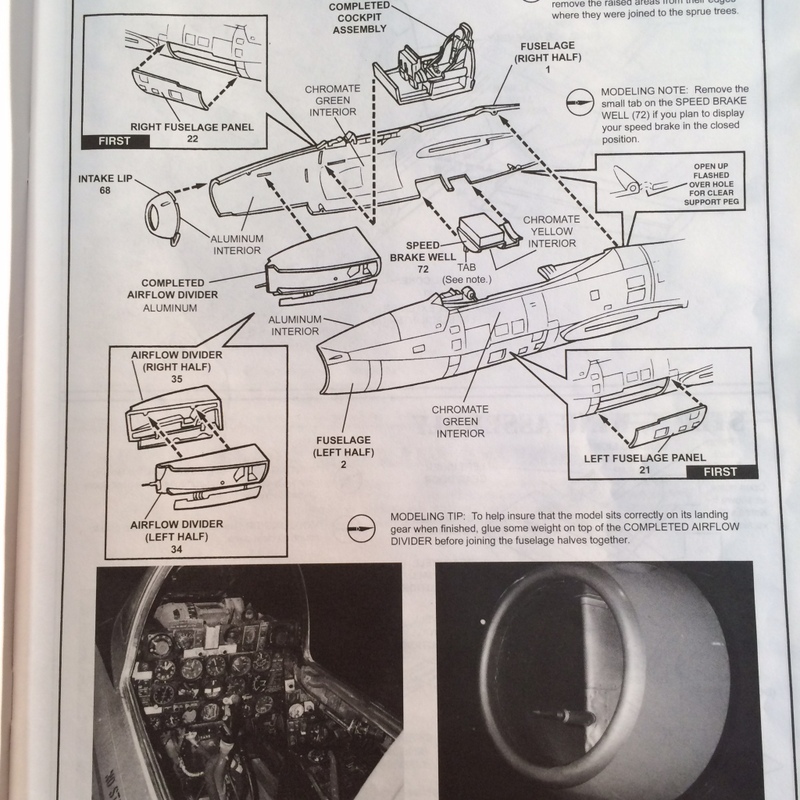 ProModeler instructions have pictures of the actual aircraft. 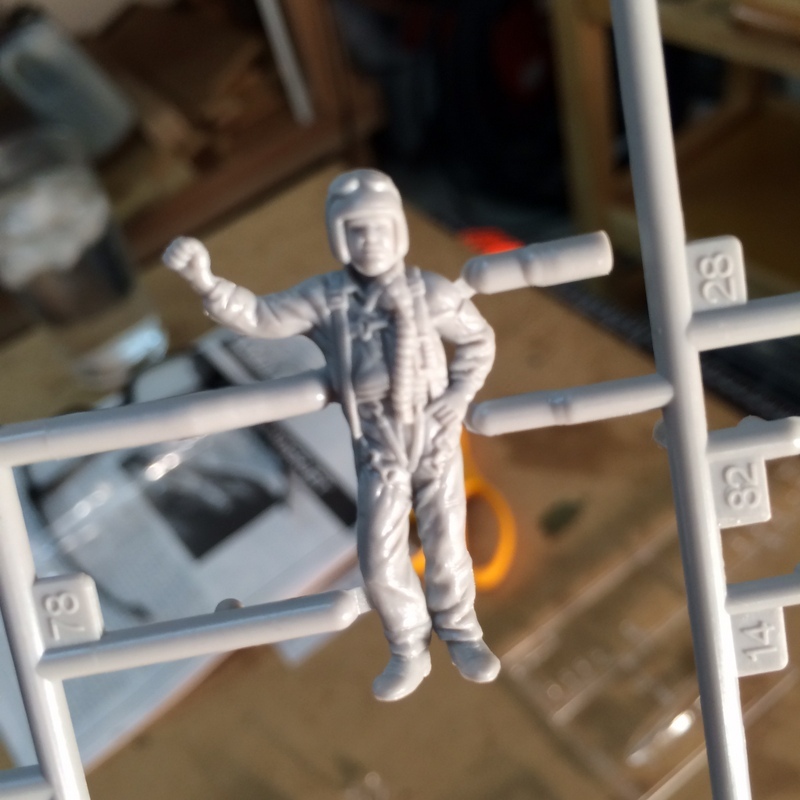 As you can see there are some nice panel lines and a bonus standing pilot in the kit. I’m looking forward to moving this one along. Actually this should have been the last kit of 2014. I’ve been working on this kit since August of last year with a long period over the late summer and early fall where it sat idle. 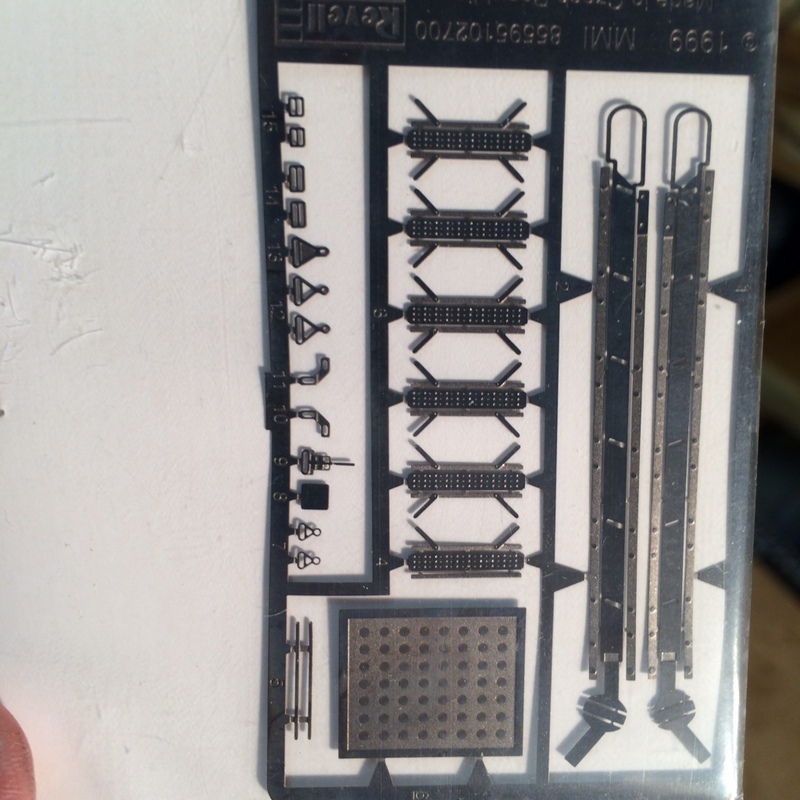 I bought this kit on eBay many moons ago and I found a couple of parts missing. I’m not saying the seller lost them as this kit has been rattling around in my stash in a rough box without plastic bags for years. But I had to fabricate one of the small flaps from scratch. 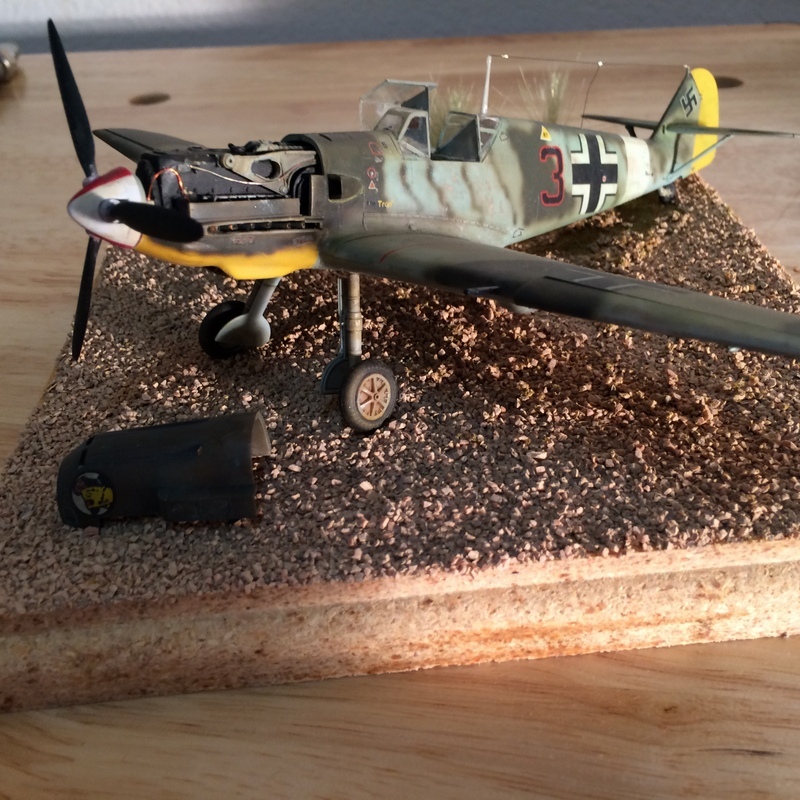 I can’t believe how big this thing is on my shelf, and putting it next to the Bf-109e I am building really shows it’s size. It would barely fit in my paint booth. I wanted to have a Black Widow since I first saw one as a kid. 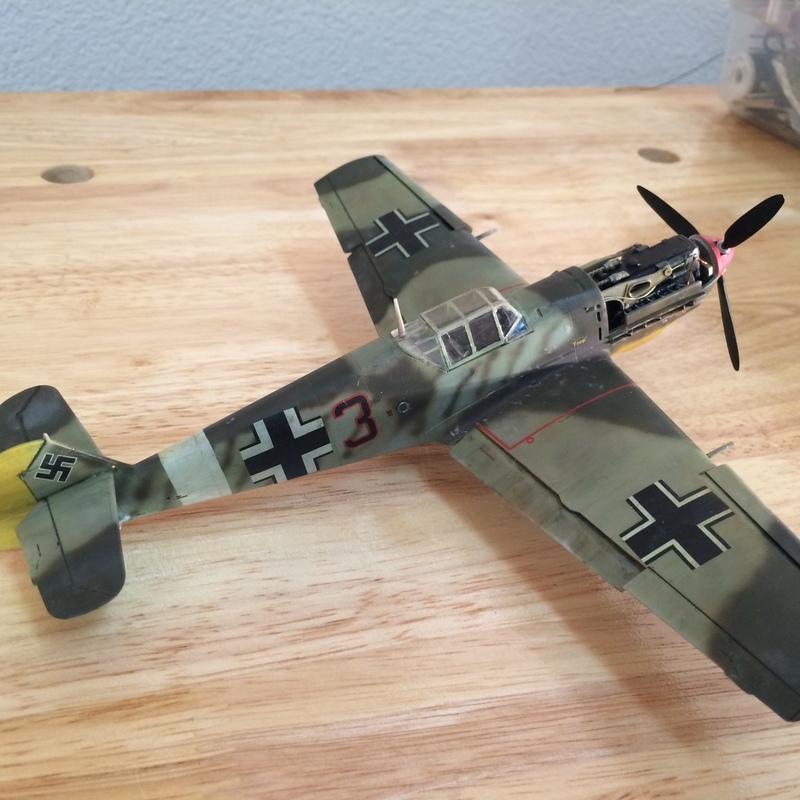 Great modeling experience – I am satisfied with the result. Greetings! 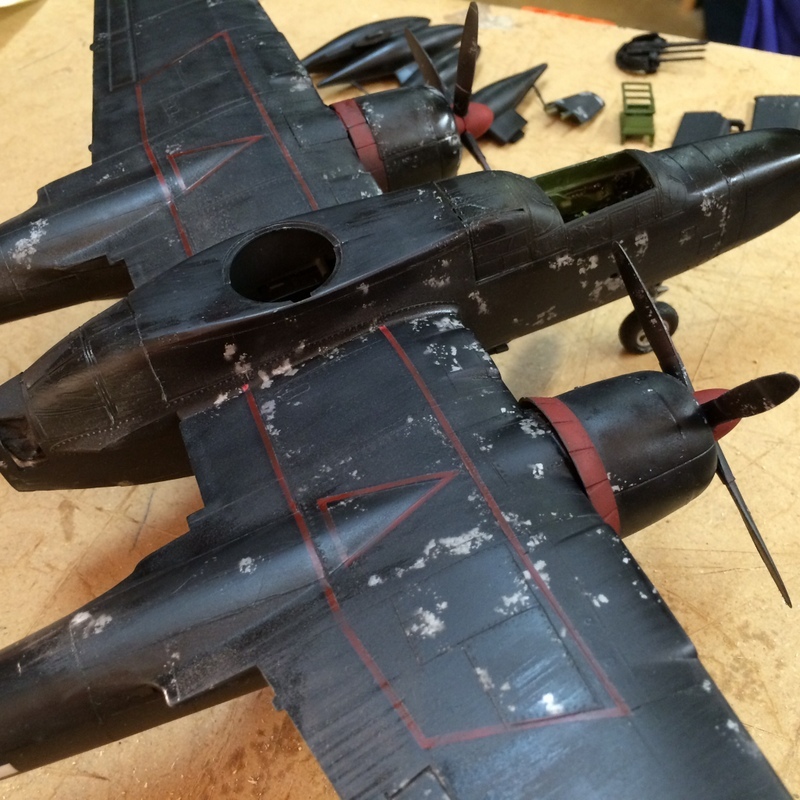 Getting close to finishing a model this year – early! 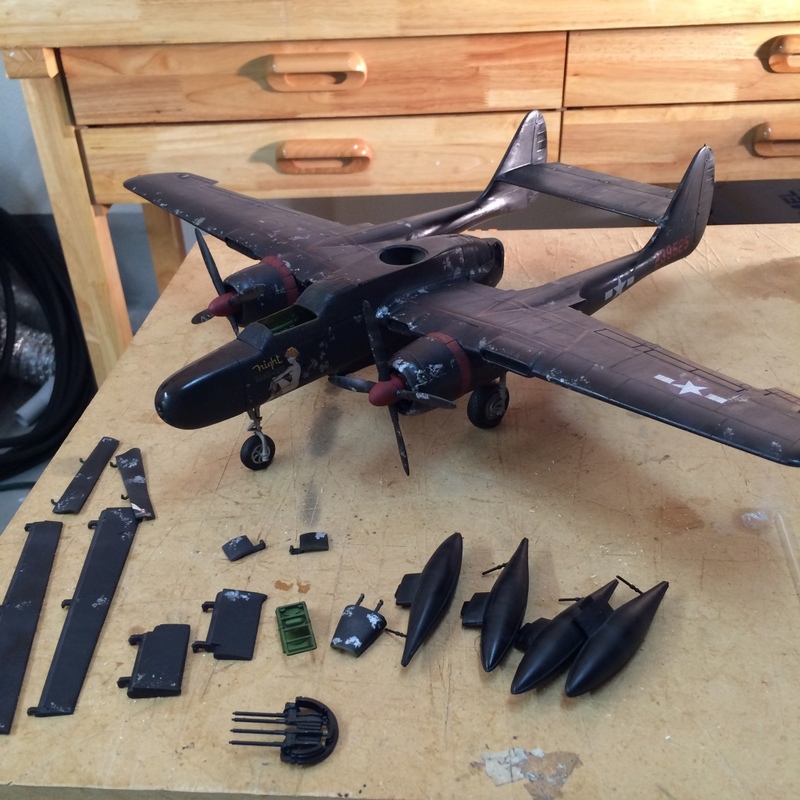 The P-61 is decaled, up on it’s legs, and the props are on. 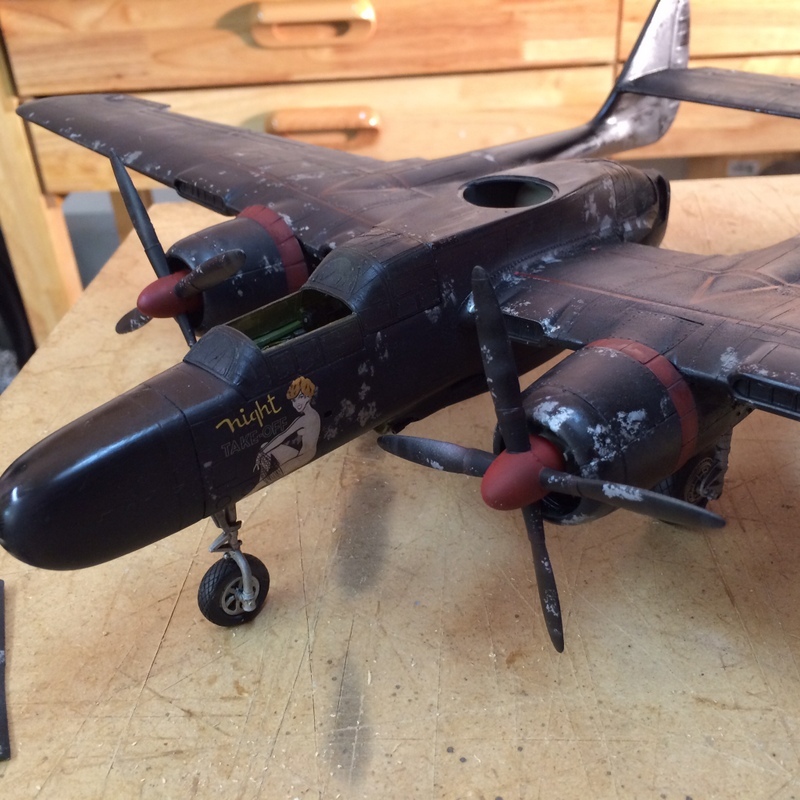 Looking like a P-61! I used a set of True Detail wheels and they look pretty good. I got to use my drill press to make sure the holes were straight for the axles. 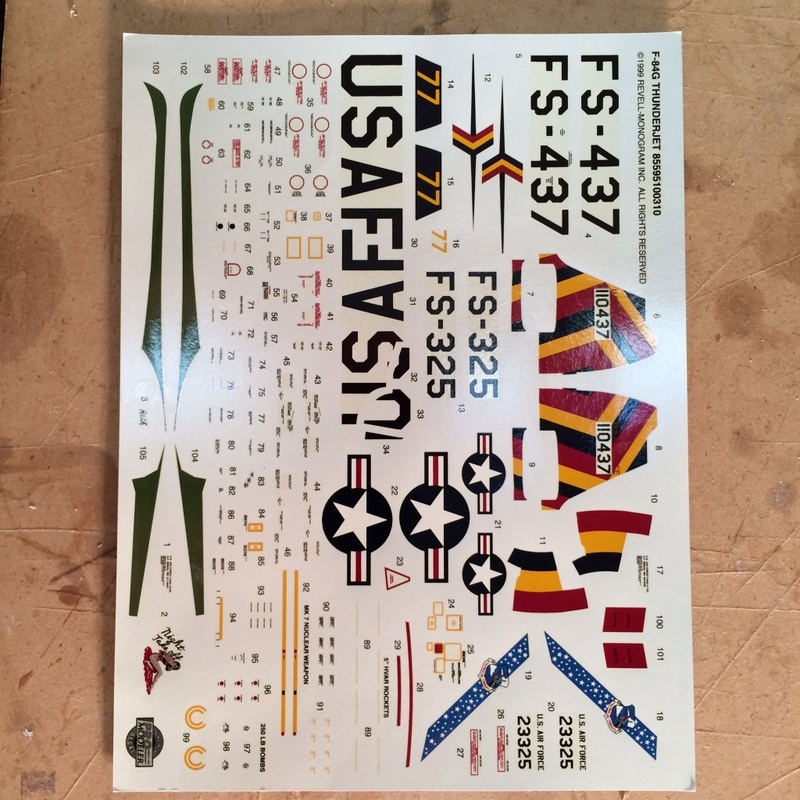 I also used Kitsworld decals, the “Night Takeoff” is only on this sheet and I have a F-84 to build next with the same “Night Takeoff” pin-up. My only issue is the decals come with nose art and serial numbers only. Of course the decals that came with this kit of yesteryear cracked up the minute they released from the paper. It would have been nice to have a whole set of insignia on the sheet for the cost. 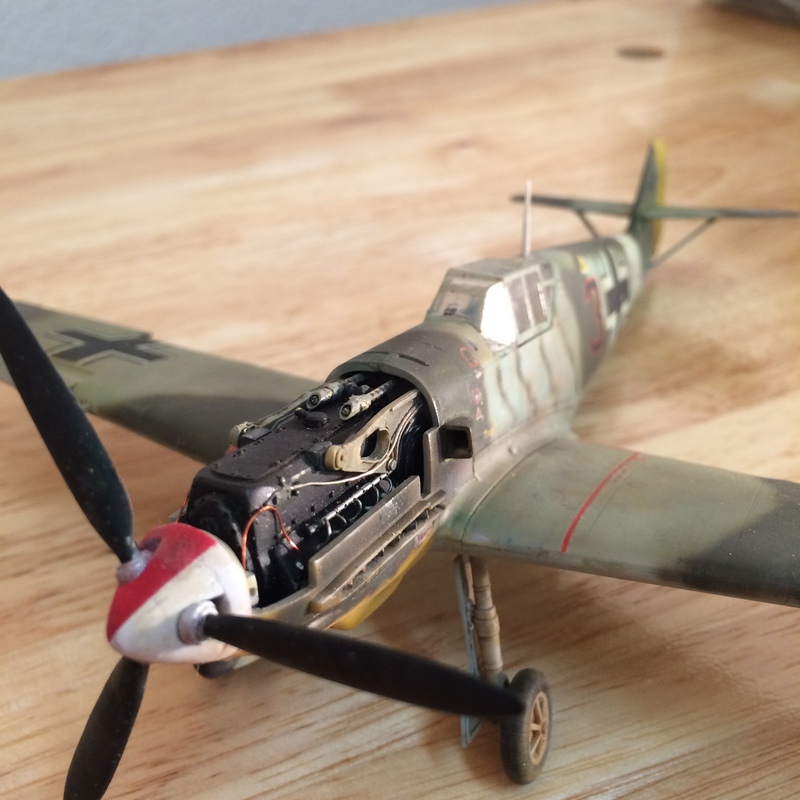 Since the national insignia is non-standard small for this aircraft I wound up using a set from a 1/72 F6F in the spares box. Using salt for the paint chipping didn’t come out too bad, although next time I think I will be a bit more conscious about where I put it. I got the random effect I was looking for and the props look great but is seemed like a bit too much. And maybe I’ll use a shinier silver paint as the aluminium I used looks almost white in some spots. 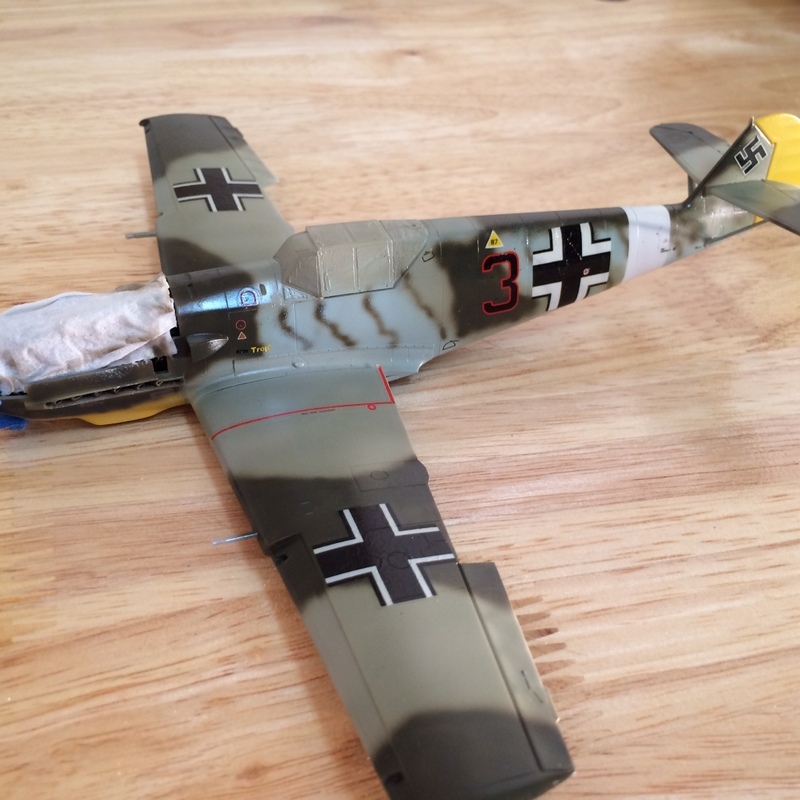 Next up, exhaust stains then an overall coat of Testors Dullcoat, then put the rest of the parts on and it’s off to decal the Bf-109e I am building concurrently.